Here is a roundup of all the Ranji Trophy action from across India. 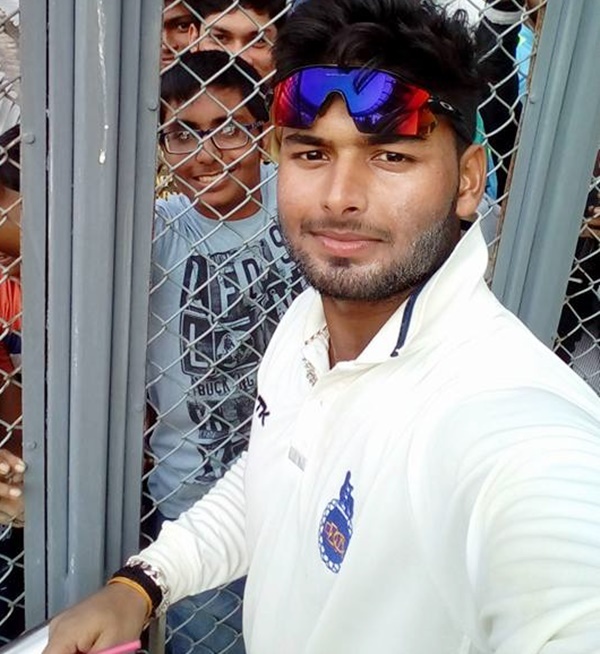 IMAGE: Delhi’s Rishabh Pant with fans in Mumbai. Photograph: Facebook. In-form skipper Yuvraj Singh's sporting declaration paid off as his bowlers fired in unison to help Punjab bundle out Madhya Pradesh for 180 and notch up a 126-run win in their Group A Ranji Trophy match, in Rohtak, on Sunday. Chasing 307 runs for an outright victory, Madhya Pradesh were bowled out in 64.4 overs at the CH Bansi Lal Cricket Stadium. Pacer Manprit Gony was the wrecker-in-chief for Punjab, returning figures of 4/41, while Siddarth Kaul (3/42) and Sandeep Sharma (2/25) provided the much-needed support at the other end. Punjab will pick six points for the outright win. Shubham Sharma top scored for Madhya Pradesh with 37, while the experienced captain Devendra Bundela contributed 32 as none of the MP batsmen could score a half century in the face of some disciplined bowling from Punjab. Madhya Pradesh were 26 for one overnight and needing another 281, they kept losing wickets at regular intervals. Diminutive Delhi stumper Rishabh Pant slammed a brilliant triple hundred but it went in vain as Maharashtra took the all-important first innings lead in the Ranji Trophy Group B match that ended in a draw in Mumbai. Pant compiled 308 off only 326 balls laced with as many as 9 sixes and 42 fours and brought Delhi very close to Maharashtra's huge first innings score of 635 for 2 declared. However, he fell in trying to hit a 10th six, one ball after he had lofted left-arm spinner Satyajeet Bachhav over the rope, when Delhi were 58 runs behind Maharashtra's first innings total. The dismissal of Pant, who had kept wickets over the first two days and then came down to bat at No.5 when Delhi were 135 for 3, ended his team's hopes as Maharashtra polished off the remaining three wickets for 13 runs to terminate the northern team's first innings at 590 for a lead of 45. In the remaining time, Maharashtra made 58 without loss before the game was called off by mutual consent. Maharashtra: 635 for 2 decl. and 58 for no loss (H Khadiwale not out 38, C Khurana not out 19). Delhi: 590 (D Shorey 71, N Rana 44, R Pant 308, Milind Kumar 45, V Sood not out 32; M Sayyed 3 for 121, C Khurana 3 for 143). Young Abhimanyu Easwaran scored his second century of the match as Bengal logged home three points against Uttar Pradesh by virtue of their first innings lead in a drawn Ranji Trophy group league encounter, in Jaipur. After securing a vital 56-run first innings lead, Bengal employed a safety-first approach declaring at 274 for six in 76 overs leaving UP with an improbable target of 331. The two captains shook hands when UP scored 70 for no loss in 20 overs. UP got a point from the game. Just like the first day, the final day also belonged right-handed opener Easwaran carried his bat through the innings with an unbeaten 110 following his 142 in the first innings. Chhattisgarh picked up three points on the basis of taking the first-innings lead as their Group C Ranji Trophy match against Andhra ended in a draw in Kalyani. Andhra were 282 for eight in their second innings when the match ended on the fourth and final day at the Bengal Cricket Academy Ground. Srikar Bharat top-scored for Andhra with 57, while Hanuma Vihari made 51. DB Ravi Teja missed out on a half century by a run, while K Ashwin Hebbar made 45. For Chhattisgarh, Ajay Mandal was the most successful bowler, picking up three wickets in 48 overs in which he conceded just 30 runs. Paceman Mohit Sharma ripped apart the middle and lower order in a five wicket haul as Haryana celebrated a comprehensive eight-wicket win over Hyderabad to take six points from their Group C Ranji Trophy match in Jamshedpur. Hyderabad resumed the day at 102 for five and Haryana bowled them out for 224, built around Kolla Sumanth's 55 and Chama Milind's unbeaten 66. Mohit took four of the five wickets that fell in the day as he removed M Sumanth (0), Kolla, Vishal Sharma (0) and M Ravi Kiran (0). Haryana needed only 85 runs to win which they scored in 16.4 overs with opener Nitin Saini scoring 45 from 72 balls and Chaitanya Bishnoi scoring an unbeaten 20. Haryana: 331 and 85 for 2 in 16.4 overs. (N Saini 45, C Bishnoi 20 not out; M Siraj 1/18). Karnataka did not impose a follow-on against Jharkhand despite taking a huge first innings lead as their Group B Ranji Trophy match ended in a predictable draw in Greater Noida. Riding on Ishan Kishan's brilliant unbeaten 159, Jharkhand were all out for 374 in their first innings in the morning session in reply to Karnataka's 577 for 6 declared. But surprisingly, Karnataka did not force a follow-on despite taking a 203-run first innings lead at the Greater Noida Sports Complex Ground. Karnataka batted for the second time and they were 162 for 3 in 53.4 overs on the fourth and final day and predictably the match ended in a draw. Karun Nair and Kunain Abbas remained not out 54 and 51 respectively as the two teams decided to call off the match. Nair's 54 not out came from 86 balls and was studded with six boundaries while Abbas faced 97 deliveries for his 51 not out and hit eight fours and one six. For Jharkhand, Samar Quadri took three wickets for 62 runs. Jharkhand: 374 all out in 115.1 overs (Ishan Kishan 159 not out; Krishnappa Gowtham 3/97, Shreyas Gopal 3/114).